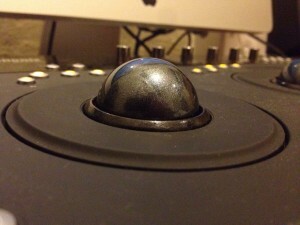 We’re currently testing the Avid (formerly Euphonix) Artist Color control surface for colour grading – more on that soon. But, I wanted to share a few surprising discoveries I’ve made about using it for editing as well. Avid Australia’s Karen Eastmure, who I know from her time at Kodak, convinced me to try the Artist Color with the new Avid Media Composer Version 6.5. I’m having a bit of a back to the future thing going on right now. About 12 years ago post production for me meant Avid for editing, DaVinci for grading and ProTools for mixing. Although I’m loving Logic Pro at the moment, ProTools is still on the radar, and the other two are back for me in a big way. Around the turn of the millennium, using each of those meant calling up the facility and booking a suite with one of these these very expensive installations. Fast forward to today and I can now use them quite effectively on the same desktop computer I’m using to write this article …plus they’re all affordable. 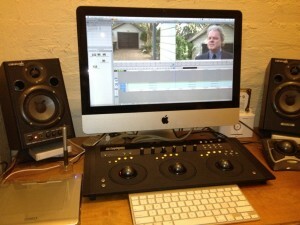 Because Avid had grown through the early days of non-linear editing where it was at first considered a very open platform because it was based around a personal computer rather than a dedicated hardware system. But it made that work by tightly controlling the special add-on hardware that was required and the management of the media in projects. When Apple’s Final Cut Pro came along it had the luxury of taking an entirely different approach by allowing users to choose pretty much whatever they wanted in terms of hardware and media management. While this has undoubtedly led to many flaky FCP installations over the years and many people scratching their heads while saying “why is my media offiline?” it also allowed a lot of people to build systems and workflows that pushed the envelope of what was possible in productions from small corporates up to feature films. The fact that this all happened as the digital revolution (for want of a better term) unfolded with the DV format and then with HD meant that the very open framework of Final Cut Pro allowed for a lot of cutting edge work to evolve very quickly as new hardware like the Decklink SDI input-output cards came onto the market. While all of this was happening, Avid remained as the workhorse of most Hollywood editors and much of the upper end of the industry around the world. Because it was a more restrictive system, it was often more reliable and robust. Although the pace of technological change has only increased in recent years the changes have become more of an extension of a well established trajectory now and Avid has responded by making it’s flagship Media Composer a more open and flexible platform without removing the options for the rock-solid systems that the editors pushing out films, ads and tv series rely on. So with all of that backstory I sat down recently with Media Composer 6.5 to test the Artist Color control surface. The interface of the software still looked like the Avid that I remembered but it has certainly been refreshed and after 12 yrs with FCP, I immediately felt more at home in Media Composer than my first impressions of FCP-X. If for no other reason than to have something to colour correct, I imported some footage and started throwing shots on the timeline. A little side note here, using the Import menu option does the traditional Avid thing of converting the footage to one of the Avid formats and managing it’s location for you, while using the Link to AMA Files option allows you to use media from it’s existing location in it’s current format, like FCP v1-7 did. One thing that used to drive me mad with Avid was that it insisted on converting VFX shots that had already been rendered into an Avid codec. Now that’s a thing of the past, while Media Composer still encourages you to let it do the leg-work of managing your media it now lets you take the wheel when you want or need to. 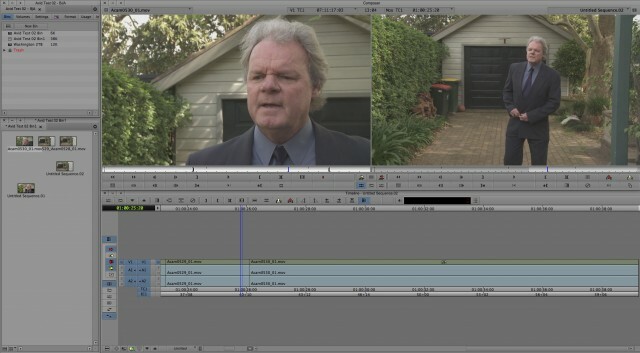 Cut editing with the mouse and the JKL keys for Reverse, Stop & Forward playback did exactly what I expected them to, as did the I & O keys for in and out edit points and the left & right arrow keys for frame by frame navigation. In virtually no time I had a short sequence in the timeline to play with grading, then something dramatic happened. I had accidentally bumped one of the trackballs on the Artist Color and the timeline started shuttling slowly. It was alive in editing mode. After a bit of quick research I learned that the Artist Color and Media Composer 6.5 are indeed designed to work together with a number of editing functions. I’ve been a huge advocate of control surfaces for sound and grading and it has been great to see how that landscape has grown over recent years. With editing I’ve become totally accustomed to cutting with a standard keyboard and the combination of a USB trackball and small Wacom tablet. With the Artist Color the lefthand trackball controls the Shuttle function for the source clip with the trackwheel controlling the Jog. The righthand trackball and trackwheel do the same for the timeline while the middle trackball functions like a mouse-trackball. Along with this, the function buttons offer a lot of the usual editing functions like marking in and out points dropping edits into the timeline and zooming the timeline. The playback controls on the surface have reverse, stop and forward (like JKL) and dedicated buttons for skipping forward and back by clip. The shuttle function is probably of limited practical use because it is so easy to shuttle with the JKL’s (or the surface equivalents) and one of the few things that a mouse does very well in editing is skimming through a clip or timeline and going quickly to a rough point in time. The jog wheels on the other hand are very impressive and useful and the big eye-opener here is having two of them. Even back in my tape-to-tape online days I’ve really only worked with units like the BVE-910 with a single jog-shuttle wheel. With the two wheels on the Artist Color and MC 6.5, you can switch between the source or timeline windows just by moving the left or right wheel and then you’re instantly working in that space with the other controls. 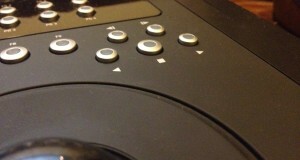 The Avid Artist Series of controllers all use Ethernet rather than USB to connect with the computer they’re controlling. Avid say that this is because Ethernet provides better performance and control than USB and that is clearly illustrated by the feel of the jog wheels in editing mode. The connection to the footage and the responsiveness of the control is quite remarkable. It is not an exaggeration to say that it is a more direct feeling of control than the jog-shuttle dial on a top-end broadcast VTR. It really feels more like film rewinds or analogue reel-to-reel tape, where you are actually pushing and pulling the media in a very natural way. Having this direct control and being able to rock back and forth between the source footage and the timeline without even taking your eyes away from the part of the screen displaying the images is a very exciting way to edit. The footage I used for this test was from a scene out of McLean’s Money which I shot and edited and I would say I am very familiar with the detail of. Working with the footage in this way actually focussed my attention on the performance to a level that I didn’t experience in cutting the scene as it appears in the film. Would this scene have been significantly better if it was cut using the control surface? Probably not, it wasn’t a complicated scene and was a pretty simple edit. But the fact that this controller was helping me see things in the performance that I hadn’t noticed before really made me wonder about what this would contribute to the edit of a difficult or complex scene. From products with very different histories, the Avid umbrella has brought together an unlikely pairing of the Artist Color and Media Composer 6.5 to be a powerful team when it comes to editing. In a matter of minutes I’ve gone from a skeptic of Ethernet connection to a complete convert and I’ve rediscovered the enjoyable and satisfying experience of editing without looking at the keyboard or reaching for the mouse. But the really exciting part is realising that what I’ve been enjoying is the surface and the software outside their comfort zone. How will the Artist Color perform when it’s doing what it was built for and how would Media Composer perform with the Artist Transport?